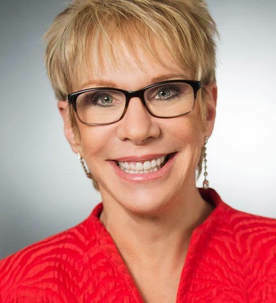 Barbara Huson (previously known as Barbara Stanny) is the leading authority on women, wealth and power. As a bestselling author, teacher & wealth coach, Barbara has helped millions take charge of their finances and their lives. Barbara's background in business, her years as a journalist, her master's degree in counseling psychology, her extensive research, and her personal experience with money give her a unique perspective and makes her the foremost expert on empowering women to live up to their financial and personal potential. Barbara has been featured on Good Morning America, The View, Extra, The O'Reilly Report, and many times on CNN, MSNBC, CNBC, Fox News, PBS and NPR, as well as the New York Times and USA Today. Barbara is the author of six books: Prince Charming Isn’t Coming: How Women Get Smart About Money, Secrets of Six-Figure Women: Surprising Strategies to up Your Earnings and Change Your Life, Overcoming Underearning: A Five-Step Plan to a Richer Life, Finding a Financial Advisor You Can Trust: A Guide for Investors and Those Who Want To Be, Breaking Through: Getting Past the Stuck Points in Your Life, and Sacred Success: A Course in Financial Miracles. Nancy Burger, senior editor, spoke with Barbara about her new book, Sacred Success, her recent decision to change her name, and her mission to empower women and help them find a path to confidence and self-worth. I'm curious about your decision to change your name - a huge move for someone who has established their brand over as many years as you have. Can you talk a bit about that decision? From my father to my first two husbands, no men in my life were ever happy with me. They always wanted to change me. Then, I met my husband Lee and, I'll be darned, he's so happy with me! He just wants to love, appreciate and support me every minute of every day. So here I am. We've been married for six years, together for ten, and I realize that I'm seeing myself differently. I realize there's nothing wrong with me. It infused me with a new self-love. This concept of self-love is central to the Sanctuary message and why I want our readers to understand it. We become who we surround ourselves with. I've always had women who love me - my friends, my followers - but the men in my life always found something wrong with me. I finally realized that it wasn't about me. It was about their insecurities, about things that were unresolved or buried in them. Was your first book, Prince Charming Isn't Coming, inspired by your experience with your first husband, a compulsive gambler who left you with a huge tax debt? It was in the wake of that, yes. When he left me with over a million dollars in tax bills, I didn't have the money, my father wouldn't lend it to me, and I was beside myself. I had three young daughters and didn't understand money at all. But I was a journalist at that time, writing for the San Francisco Business Times and, out of the blue, an organization hired me to do a research project that involved interviewing women who are smart about money. Before that, I was determined not to understand money or how it worked. But I realized that if you don't deal with your money, your money is going to deal with you. After the tax bills, I knew I had hit bottom. I knew I had to get smart. I really believe that the Universe helps you reach your commitment - if it's a true commitment - and everything changed when I interviewed the women for the research project. I not only got smart about my own money, but I also wrote my first book, and I found myself in a whole new career offering financial education with women. The problem was, though, that I couldn't make money. What happened was, in 2000, my agent called me with what she thought was a great book idea. She said, "Why don't you interview women who make lots of money?" But I hated the idea, the thought of talking to designer dress snobs. Then I realized, "Oh, if that's what I think of successful women, how will I ever let myself become one?" So, I started interviewing six-figure [income] women for the book Secrets of Six-Figure Women, and I also started making six figures myself before I even finished the book. Okay, let's dig into that. What was the pivot point? Pretty much the same thing that happened with my first book - it opened my eyes to the fact that it wasn't so much what these women did as it was how they thought. When they shifted their thinking, that's when everything changed. These women all had "aha" moments, and it was the accumulation of these realizations that empowered them to overcome their fear, get past their resistance and understand money. The first realization is that no one else is going to do this for us, that Prince Charming really isn't coming. I was raised to believe there would always be a man, but I found out that wasn't true. How many women did you interview for Secrets of Six-Figure Women? I think I interviewed 150 women, and they were all very confident, as you can imagine. But as we got deeper into the interviews, it became clear that virtually every single one struggled with fear and self-doubt. Even after they were successful, they still struggled. And ninety percent of them struggled with the imposter complex. * I felt the same way, but the difference was that they didn't let the fear stop them. In the world of women, there's no such thing as fearlessness. In fact, my mantra became, "do what you fear, because that's how you grow." But that's not an easy thing to do. Our brains are wired for survival, so everything in us says "don't go there." Tell me about the path to your latest book, Sacred Success. I woke up one night and thought, "I'm doing great. I'm making six figures. Now I want to make seven." My new goal was to make millions, help millions and give millions. And I knew exactly how I was going to do it - I would interview women who made millions. Well, three years later, I was having the worst year I had ever had and was nowhere near a book. I had a coach at the time who told me, "Barbara, you're too into doing, and you need time for just being." So, I went on a retreat and took the transcripts from all of the interviews with me. I realized then that I was looking at the wrong thing. I was so dazzled by how much money these women made that I completely overlooked the far more important story of how they were doing it. It was during this retreat that I entered the process of discovery and the path toward Sacred Success, and I took another nine months off. Your intention was to be present? My intention was to surrender and receive. I had been so busy working and struggling and forcing, like I had done my whole life, but realized it wasn't working. I'm very spiritual, and that was a big part of my journey with money, but I never talked about it in my books. Why? Did you think it wouldn't be well-received? I was terrified that everyone would think I was a flake, that people wouldn't take me seriously. It was so irrational. I discovered through my discussions with women for my first book that their difficulty with money has nothing to do with money itself. It's their fear about power - who they thought you had to become to be successful. I remember interviewing a psychologist and asking her about this…about why women are afraid to step into their power. She said something that gave me chills: "Because powerful women were at one time burned at the stake." What's your definition of a powerful woman? Someone who knows who she is, knows what she wants, and expresses that in the world unapologetically. I think we are so afraid to speak up, to ask for what we want and say no to what we don't. We're so afraid to rock the boat that we water ourselves down so we don’t make waves. And that's really what I want to change. Money is just the metaphor. What I want to do is empower women to step into their greatness, so they can be leaders, whether it's in their home, their company or in the global landscape. To own their power. That's going to change the world. I feel like it's my ministry. 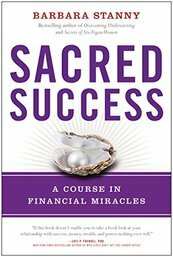 Your newest book, Sacred Success, really does weave together the spiritual and the financial. Yes. All my books have been about the inner and the outer work - the emotional and the practical stuff - because that's been such an important part of my journey. This is the first time I've come out about it so openly. And how is it getting received? Is it resonating with your audience? It's amazing. I've even heard from men. I'm shocked that it is being so well received, and I realize that some part of the world is hungry for this spiritual connection. I really believe that when you bring the Divine into the conversation about the almighty dollar, then financial success becomes more than just a practical process - it becomes a spiritual practice, it becomes a right of passage into our power, it becomes a healing journey. Do you think people are also hungry for authenticity? That they're getting sick of sleepwalking? Ooh, I like that. Yes. People yearn to be real, and they yearn to hear from people that are real, which means people they can trust. If you had to encapsulate the major themes women are struggling with today, what would you say they are? Number one, of course, is fear. But also, a lack of self-worth and self-confidence. What the surveys continue to show is that women really do want to get smart about money, but they aren't doing enough to protect themselves financially because they lack the confidence. So, I think it's also a lack of financial education that's presented in a way that women can absorb - the financial industry is totally male-dominated. Money really isn't complicated, but people who want to feel self-important make it sound complicated. It's so simple. I used to think there were these secrets that men knew about money. There are no secrets. Learning about money is really simple, and I have learned how to converse with women and educate them about finance in a way that tackles, not only the outer work, but also the emotional and the psychological. Money is a very emotional topic for women. Do men and women view power differently? Yes. Men view it as power over, but women view it as power with. I think men are afraid that if they give women power, we will dominate, but we have no desire to dominate. We want to collaborate and partner. Barbara, where is your sanctuary? My home. I never want to leave it. I'm such a home body. It gives me fuel for getting out into the world. *Impostor Syndrome is a pervasive feeling of self-doubt, insecurity, or fraudulence despite often overwhelming evidence to the contrary.